Chip Ellis stunned the Pro Stock Motorcycle field at the NHRA Toyota Summernationals at Englishtown, NJ, coming out of nowhere to take the #1 qualifying position on the Pirana-Z S&S® powered Buell®. And while Jerry Savoie took the event win on a Suzuki, Hector Arana Jr. set the track speed record on his Lucas Oil Buell. Three weeks ago Ellis wasn’t even planning on racing at Englishtown. He was called on by Pirana-Z team owner Junior Pippen to help out with Pippen’s new rider, Jeremy Teasley, at the Atlanta event. When Teasley could not make Atlanta, Pippen asked the veteran Ellis if he wanted to ride the bike. “I said ‘Heck, yeah, I want to ride!” said Ellis. Ellis has a rich history in the sport. He earned championships in AMA Dragbike competition in Funnybike, 600 SuperSport and Formula Superbike when he was the Kawasaki factory rider. He also rode the prototype S&S Kosman Buell run by George Smith and George Bryce in 2004. 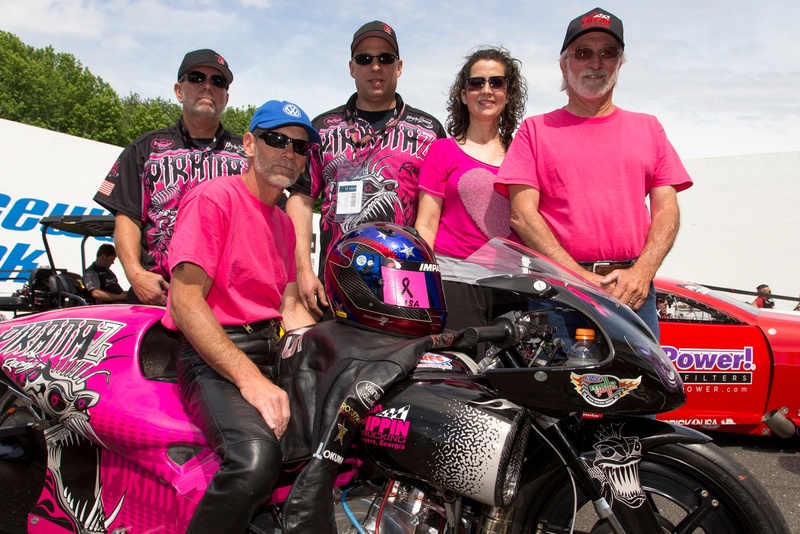 His last full-time ride in NHRA competition was on the Kuryakyn® Buell of Harry Lartigue in 2011. The last time he competed was when he filled in for an injured Jerry Savoie in 2013. Pippen, once a star in the AHDRA, pulled out of full-time racing a few years ago to care for his wife Lisa, who is battling breast cancer. The newly minted team of Pippen and Ellis qualified 15th at Atlanta and went out in the first round of eliminations but Pippen liked the chemistry and decided to have Ellis ride at the Englishtown event. Englishtown didn’t start out well for them. They hurt their #1 motor during qualifying on Friday and had to put in the backup bullet for the first session on Saturday. Ellis ripped a 6.801 at 197 mph to go to the top of the list. A strong run for sure but most of the fast bikes still had two qualifying laps in front of them. As it turned out all those good bikes couldn’t catch the pink Buell. Savoie came close, running 6.084 at 197.13 mph to take the second spot. It was Ellis’ first number one qualifying performance since Memphis in 2009. 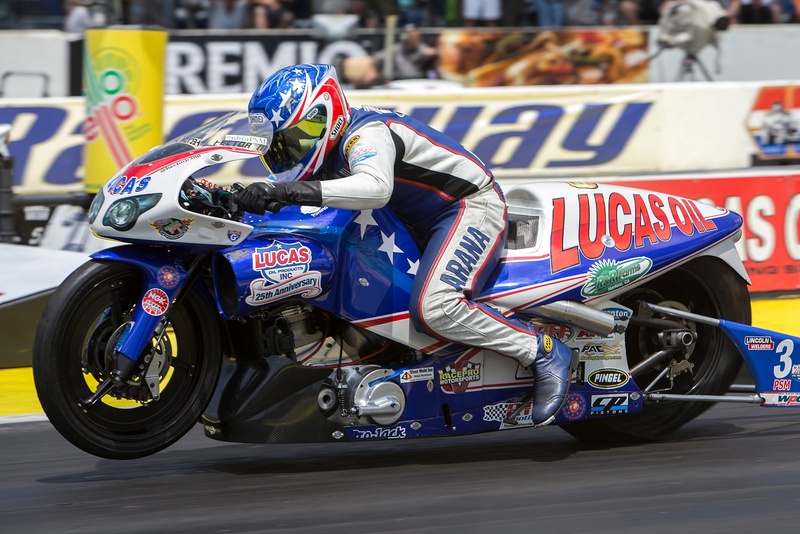 Hector Arana locked in the third spot at 6.815, setting a new Englishtown Raceway Park track speed record at 199.35 mph on the S&S powered Lucas Oil Buell. He only held the track record for about two hours as his son, Hector Jr. re-set the record on his own S&S powered Buell at 199.37 mph in the final session. Ellis went from basking in the glow of the #1 qualifier parade to a mad thrash on Sunday morning when the team went to warm up the motor prior to eliminations only to discover a scuffed piston. They pieced together a working motor from the two broke units and just made the first round call where Ellis got by Angie Smith with a 6.87. The party was over in round two when the bike refused to turn over in the burnout box. Meanwhile all eyes were on the Arana’s as they looked to have a shot at cracking the 200 mph barrier. Sunday’s warm temperatures and slight headwind conspired against them and they were off the torrid pace from Saturday. Both ran 197 mph when they faced each other in round two with Jr. taking the win. A round later Hector Jr. redlit against the eventual winner, Savoie. Savoie tore it up in eliminations. He became the first Suzuki® rider to run under 6.80 seconds and did it three times in a row, with a best of 6.785. His win over Jimmy Underdahl’s Suzuki was his second career win. 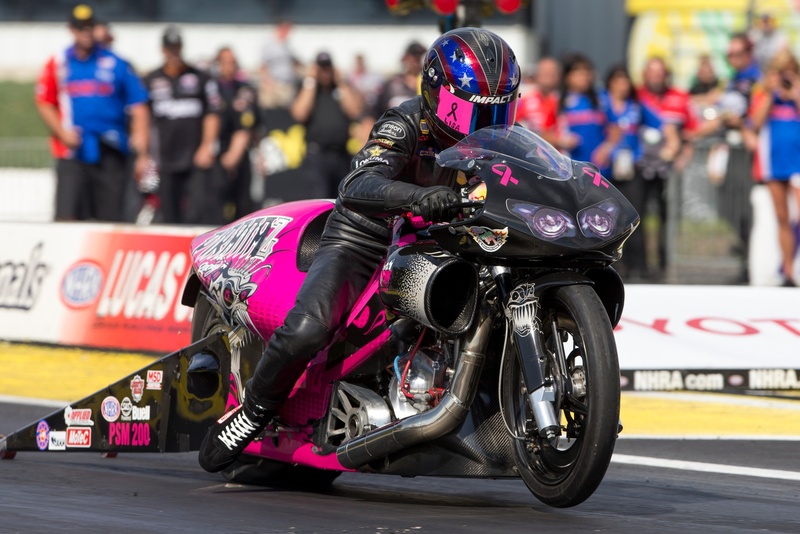 There is no question that the Suzuki’s are running hot this season and there is a thought that the NHRA’s new fuel mandate, switching from VP C-25 to Sunoco SR18 favors the inline four cylinder bikes. Four of the top eight qualifiers were Suzuki’s and it was the first all-Suzuki final in almost four years. The next event on the NHRA Mello Yello Pro Stock Motorcycle tour is the Summit Racing Equipment Nationals in Norwalk, OH, July 2-5.